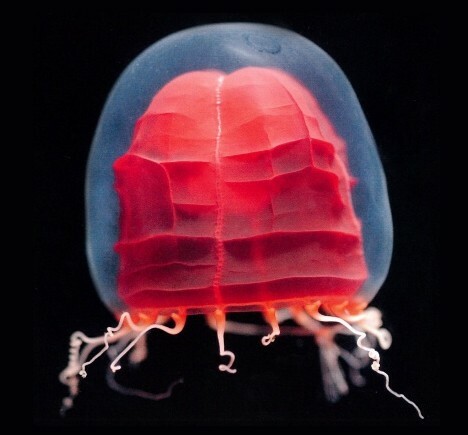 This is Pandea rubra, the Red Paper Lantern Jellyfish. They live in the more northerly parts of the Atlantic and Pacific Oceans as well as the Southern Ocean. 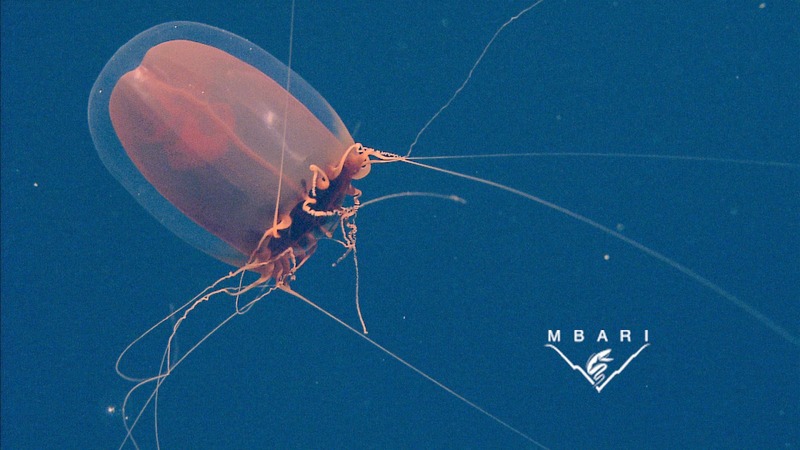 Around Japan, they've been found at impressive depths of 450 to 1000 metres (1,475 to 3,280 ft). They reach around 10 or 15 cm (4 to 6 in) long not including 15 to 30 tentacles which can get several times longer. As they squish themselves up to swim, the red stuff within the gelatinous bell crumples up and concertinas just like a real paper lantern! Many deep sea creatures are attracted to this hydroid jellyfish, but not simply because it looks lovely. They actually move in! Possibly because because it looks so lovely. Not only have amphipods been found living on the Red Paper Lantern Jellyfish, but also male and female Sea Spiders carrying eggs and whole groups of other, tiny jellyfish. This is a highly desirable residence! 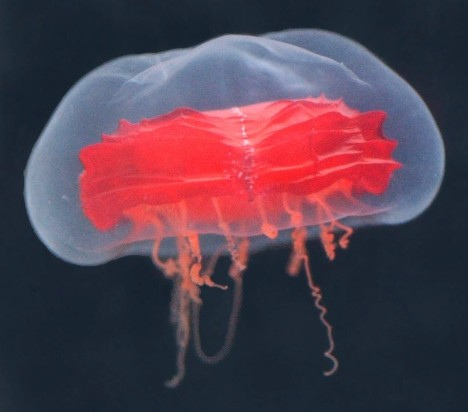 But the Red Paper Lantern Jellyfish also returns the favour. Do you remember how jellyfish have a polyp stage that usually attaches itself to a surface? Well, what do you do if you may never see the sea floor in your entire life? The Red Paper Lantern Jellyfish has a solution. Their polyps live on the shell of a surface dwelling Sea Butterfly. And I mean ONE. They only accept the shell of one particular species called Clio recurva! I guess when you're providing a luxuriant home for so many other creatures, you can afford to be choosy about your own housing. This is an amazing glimpse into how surface and deep waters link together. It's also amazing to see how a jellyfish, not exactly terra firma, serves as home for all sorts of things that require a surface to live on. But of course, there is the old problem of ocean acidification. This limits access to carbonate ions, the very things that Sea Butterflies need to build their shells. Perhaps the Red Paper Lantern Jellyfish can't afford to be so choosy after all? Yes! Nice to have some deep sea decorations!